The colored concrete ceiling adds dimension to the unit's interior. 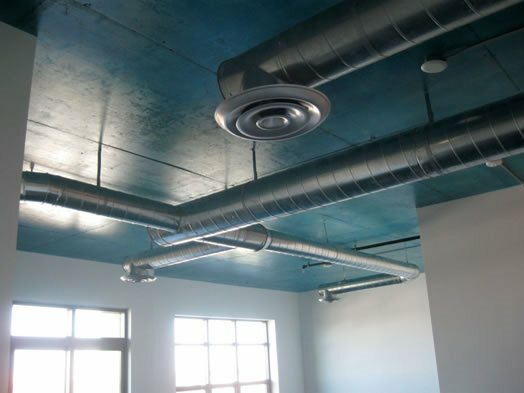 The turquoise colored concrete ceilings complement the turquoise stained concrete floors below. 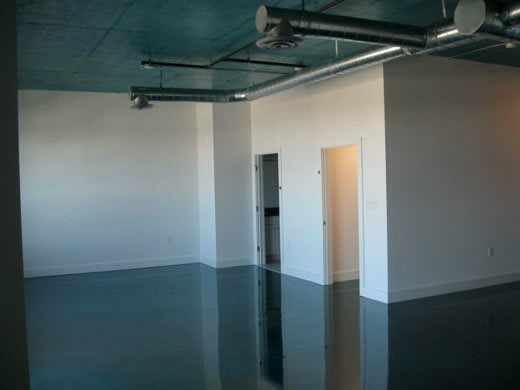 In two new condo units in downtown Norfolk, VA, Zack Pease of Concrete Concepts met with the units' owner, and they talked about colors and finishes for the concrete floors. Then the homeowner looked up and said, 'What should we do about the ceiling?' 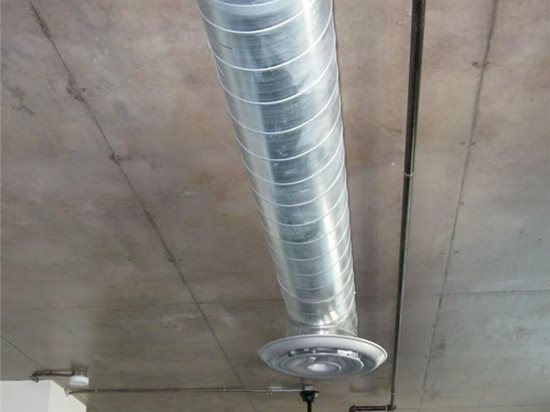 The poured concrete of the building doubled as the unit floors and the ceilings of the units below. Pease suggested, 'What about staining it too? I'm sure we could do it.' Although this new endeavor presented its own set of unique challenges, the results were above and beyond expectation (pun intended!). In fact, another unit owner saw the results and wanted their condo ceilings done as well! "You typically don't look up for stained concrete," explains Pease. "And it's not something you regularly hear about being done." Pease stained the floors and ceilings of three 3,000 square foot units. "We had trouble with just about everything," he recalls. "From the prep work, and having water run through from the 7th to the 6th floor, to acid smell complaints, we dealt with it all," he says. "First we had to tape off every square inch of everything," says Pease. Because the units were finished, the floor, walls, windows, even the exposed ductwork in the ceiling had to be taped off. "It took three days to mask one unit," he recalls. Using AmeriPolish Dye-N-Seal with the Patriot sprayer system, Pease used the same approach to the ceiling as he did to the unit's floors. "It was the same procedure," he explains, "just overhead. We used the same color as the floor, only toned it down about 50% in intensity." A different sealer was used on the floor versus the ceiling. On the floors, Pease applied a 100% solids epoxy for a vibrant, rich color. On the ceiling, he used a water-based cure-and-seal for a more subtle, satin sheen. The result? The condos each have a unique look with the depth and contrast provided with stained concrete floors and ceilings, a surface you don't typically find stained with concrete. As Pease happily says, "Now we look up in the air as well as the floor for stained concrete jobs!"